Lucy (Scarlett Johansson), an American studying in Taiwan, is tricked by her boyfriend into becoming a one time drug mule, tasked with delivering a briefcase to Korean drug lord Mr Jang. However, after Jang kidnaps her, he places a large quantity of new drug CPH4 in a plastic bag inside her, and sends her on a plane to Europe. Whilst in captivity, one of her captors assaults her, causing the bag to split, with the new drug's contents being absorbed into her blood stream, activating extra parts of her brain. Lucy gets in touch with Professor Norman (Morgan Freeman), a lecturer on evolution, and together they begin analysing the effect the drug will have on her whilst the drug gang start hunting her down. The whole "you only use 10% of your brain" idea is, obviously, great for cinema. It was used well in 2011's Limitless, which unfortunately made Lucy sound like a bit of a rip off. Thankfully, though, it is nothing of sorts. Whether you believe the 100% myth is entirely down to personal opinion. Many have argued that it is entirely false, whilst others claim it to be true; yet it has never been scientifically proven either way. Lucy relies so heavily on this idea that if you don't see it as true, the basic structure of the film begins to fall apart. Taking a risk like this on a pretty big film is impressive in its own right, which is why it's such a treat that Lucy is, in many other respects, a very, very good film. Johansson here proves why she is one of the biggest names on Hollywood. Fresh from her repeated role as Black Widow from the Avengers franchise, she nails the action scenes with ease. But it's the quieter moments where she truly shines through as an actress. An early scene in the film remains in a close up on Lucy's face, as she phones her mother and recalls all the advanced senses and distant memories she is beginning to remember under the effect of drug running through her bloodstream. "I can feel the air. I remember the taste of your milk, and the colour of the room". You might question the calmness of her mother during this scene, but you can't deny the emotion Johansson is able to convey so early into the film. Freeman is, as always, fantastic too. He's playing a wise man, so with that voice he doesn't need to do much acting, really. Lucy is also fairly innovative in terms of its style. Early scenes draw many comparisons to the fact that humans are animals by using stock footage of cheetah attacks and mouse traps as a metaphor for Lucy's situation. However, again, this also depends on how you look at it. Some may interpret this in a different way, and view it as director Luc Besson having little faith in his audience and attempting to heavily reinforce his ideas in order for them to come across. 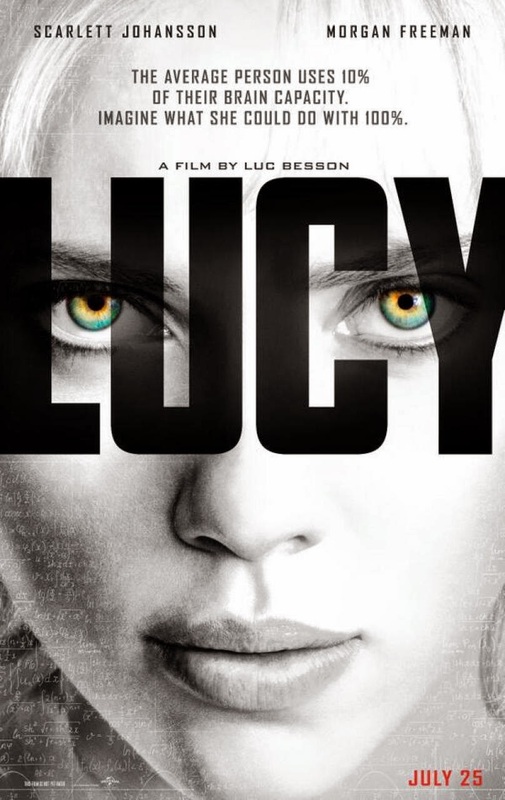 Lucy has polarized audiences and critics alike, and it is easy to see why, A film about a woman unintentionally taking a drug, giving her access to telepathy, telekinesis and other abilities through her own brainpower is a bit of an odd one. But its themes and ideas are so interesting, so compelling, that you just beg for it to dive deeper into them. And, thankfully, it does. One thing I really appreciated in Lucy is how strong Besson gets his themes across. So many action films nowadays don't have their own ideas beyond visual effects and set pieces, which is what made it so refreshing to be able to enjoy themes of existentialism and evolution amidst the action. Much like everything that came beforehand, the ending of Lucy is likely to divide viewers. Some may view it as a cheap conclusion, but I read it as so much more. Not only does it work on a cinematic level, but it really ties in with the themes that Besson has laced the whole way through. It also made what seemed like a lazy title become so much more relevant, which helped too. Lucy will likely wind up the most polarizing film of the year, yet I couldn't help but love every minute of it. The writing is strong enough to evoke emotion in a character we've spent roughly twenty minutes with, supported by powerful acting to convey that very emotion. The plot runs along at a swift pace, it isn't overloaded with characters, and the visual effects are just as impressive as you'd expect. In fact, the only thing I can criticise is the run-time; 89 minutes is far too short for an action thriller anyway, let alone one this good. It sort of makes you wonder what kind of world we live in when a movie this great gets stuck at less than the standard 90 minutes, while a Transformers movie almost doubles it. The world that Lucy takes place in may not quite be the world we live in, and the myths it represents as facts may put off some viewers, but just go with it. If you do, you'll struggle to find a film so enjoyably silly, yet so intelligent all year. To Summarise: Smart, sophisticated and boasting a stellar performance from Scarlett Johansson, Lucy offers viewers the rare opportunity to learn from its themes and ideas amidst the simply thrilling action.